Electrolytes are liquids involved in the marking process "electro-chemical etching". The electrolyte to be used depends on the alloy that is marked and the type of mark one is trying to accomplish (surface etch vs. deep etch). Electrolytes are non hazardous and safe to use, but should not be taken internally. All electrolytes are produced in and shipped from New Bedford, MA. Use a setting of 12 Volt AC, if the mark comes out weak, go to a setting of 24 Volt AC EX-9B is our electrolyte for black marks on high end metal surfaces. It is typically used on stainless steel, chrome plated surfaces, nickel plated surfaces, cadmium plated surfaces and bronze. EX-21 has different effects on the metal surface. EX-D20 is our go to electrolyte for deep etching. It leaves a clear, deep mark. The marking depth will depend on your specific alloy. As a rule of thumb assume 0.5 thou depth for a 3 second marking cycle. EX-D20 does not deep etch aluminum, use EX-4. Use a setting of 24 Volt DC DEV-1 is the developer solution for our self stencil material. DEV-1 is perfectly safe for operator and environment. EX-33 is our electrolyte for High-Nickel alloys and it is our go-to solution for CoCr implant grade alloys, it will give you a high contrast black mark with no chipping. Applications have a wide range, most applications come from high temperature resistant alloys like Inconel (High- Nickel alloys). Other applications include SN Coatings (Tin) and ZN coatings (Zinc). Use a setting of 12 Volt AC or 24 Volt AC. If you are not sure about your specific application we will be happy to test your parts for you. 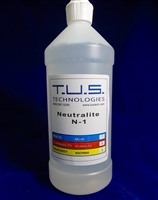 Electrolytes are liquids involved in the marking process via electro-chemical etching. The electrolyte to be used depends on the alloy that is marked and the type of mark one is trying to accomplish (surface etch vs. deep etch).